An inside look at the high-stakes world of professional sports betting -- by a journalist who lived a secret life as a key gambling ring operative. 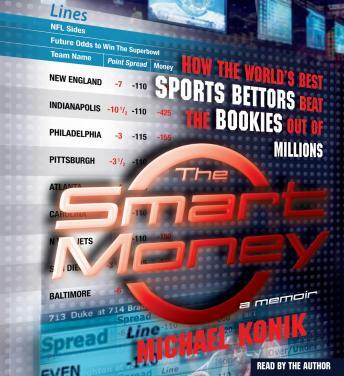 In The Smart Money, Michael Konik takes listeners behind the veil of secrecy shrouding the most successful sports gambling operation in America, to its innermost sanctum. He reveals how they -- and he -- got rich by beating the Vegas lines and, ultimately, the multi-million-dollar offshore betting circuit. He details the perks and perils of a lifestyle in which staking inordinate sums of money on the outcome of a game -- sometimes as much as $1 million on a single event -- is a normal part of doing business.